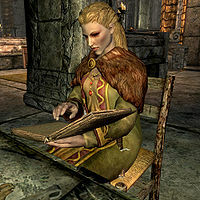 Betrid Silver-Blood is a Nord citizen who lives in Markarth at the Treasury House. Her husband is the influential head of the Silver-Blood family, Thonar, whom she only married for the money. Before the related quest, all her time is spent reading in a chair at the Treasury House. If you choose to question Thonar as part of your investigation, she is killed by Nana Ildene in a scripted death. If you choose not to question Thonar (see notes) she will survive the quest and, once you have escaped from Cidhna Mine, she will have picked up her daily routine. She sleeps in the northwestern bedroom every night between 10pm and 6am. After waking up she spends the entire day strolling around, either eating, cooking, relaxing, or reading her book. At 9am and 8pm she pauses for a one-hour meal. She wears a set of fine clothes and a pair of fine boots, and is equipped with an iron dagger. She carries a key to the Treasury House and a selection of higher-class loot and gold. She is overly snobbish and will readily tell you about her status: "I'm married to Thonar Silver-Blood. Keep that in mind while you're speaking to me. ", "My husband Thonar handles all our family's business. He's an important man. ", and "I married Thonar for the money, and I'm not the least bit ashamed to admit it." When asked if the Silver-Bloods are an important family, Betrid will tell you: "My dear vagrant, we're the only family worth knowing in Markarth. We own everything in this city, even the jail. And guess who owns the Silver-Blood Inn? Not that we named it that, the people just insisted." When asked what Thonar is like, she will answer: "He's the real head of this family. He may not be the eldest, but all the work that keeps us respected is handled by my Thonar." When exiting conversation she will either give you a patronizing: "Yes, I was bored talking to you anyway. ", or a more polite: "Take care." Betrid's death can be avoided by pickpocketing and reading Thonar's journal instead of questioning him. This page was last modified on 6 July 2013, at 23:33.